Our Elegant Event Room features floor to ceiling views of the majestic Gulf of Mexico with plenty of space for any size event. A rental fee for the use of The Event Room is $1500. Rental Hours are until 10 pm. 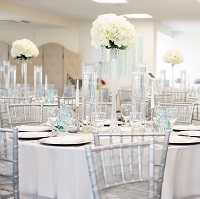 This fee includes Use of both our Event Room and our Private Beach for your Ceremony, Chairs & Tables inside the event room, Dance Floor, and Lounge Furniture. Please let your Coordinator know your table requests at booking, i.e. do you need: Guest Seating Tables, Sweet Heart Table, Formal Head Table, Cake Table, DJ Table, Sign in Table, Buffet Table, Candy Bar Table, Memorial Table etc. *Ceremony Equipment, Additional Room Decor, Table Linens, Chair Covers and any other services other then what is listed in the above paragraph are available for an additional fee and must be requested separately. Food and Beverage is provided by Royal Palm Grille. Your Event Coordinator will assist you in the details of your Food and Beverage Menu Selections. No offsite Food or Beverage Catering is permitted. Very Important: Management must approve any Décor or Equipment provided by the Client or outside Vendor. A full list of any outside items you wish to provide must be sent in writing to your Coordinator for approval. All Decor provided by Clients or outside Vendors must be set up and broken down by the Client or outside Vendor. Island Sands Beach Weddings and Royal Palm Grille Staff will not be responsible for setting up or breaking down these items unless special arrangements have been made. Please discuss your plans with your Wedding Coordinator well in advance to ensure your event runs smooth. Failure to do so may result in not being allowed to use the items you bring with you. Outside Vendors or the Client may come into decorate the Event Room after 3:30pm on the day of the event and must remove all items before 11 pm the same day. Special arrangements may be made to gain access to the Event Room earlier if needed, on a case by case basis. The client may not hang, nail, tape, staple or attached by any other means anything to the walls, ceiling, woodwork, or the exterior framing of the building. Decorative candles must be in containers. Rice, birdseed or confetti are prohibited on premises. Client or Outside Vendor Setup for all events may not begin until after 3:30pm, unless prior arrangements have been made. Sparklers are not permitted on the premises. Smoking is not permitted inside The Event Room. Any function will be terminated immediately upon the discovery of any outside Alcohol or Illegal substance (i.e. illicit drugs) brought to the premises by a client or any guest of a client. No persons under 21 years of age shall be allowed to consume alcoholic beverages. Island Sands Beach Weddings and Royal Palm Grille is not responsible for items of personal property left by a client or guest. Management does not require a security deposit to cover damages. The client understands and agrees to pay for any missing items or damage incurred to any furniture, fixtures, or equipment if the client or any guest of the client caused the damage and must pay the replacement value of item/s within 10 days.